Yet, even with this hazard posed by the volcano, there is very little in the way of monitoring equipment on the volcano. Currently, there is a lone seismometer on the volcano to measure earthquakes, one of the most important pieces of information needed to monitor volcanoes. A single seismometer is better than no seismometer, but it can only give us so much information. Without a network of at least 3 seismometers (a“seismic network”), we can really only measure if earthquakes are occurring at the volcano and not exactly where and how far beneath the volcano the temblors are happening. This is what is installed at a truly restless volcano like Mount St. Helens. These two pieces of information — location and depth — are vital for understanding what might be happening at the Glacier Peak if any earthquake swarm were to happen. Otherwise, we might have difficulty differentiating between earthquakes happening due to fault motion near the volcano or shallow changes in the hydrothermal system in the volcano rather than magma moving into the volcano from deep below. 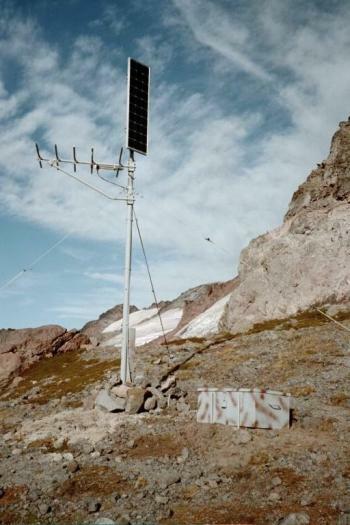 The problem becomes that a seismic station, a fairly small installation that might have a 3 by 3 meter footprint, still disrupts wilderness in order to build the station as it requires the seismometer to be buried and secured to a stable platform (like rock or poured concrete). Additionally, although many stations are solar, they do require back-up batteries that need to be changed … and if there are no roads and trails in the wilderness, getting material to the station is next to impossible.